May | 2007 | Phil-zine! Before Pirates lambastes the world I thought I would take a moment and praise this little film that has almost more passion than it knows what to do with. Passion for Paris and even more so, passion for cinema. 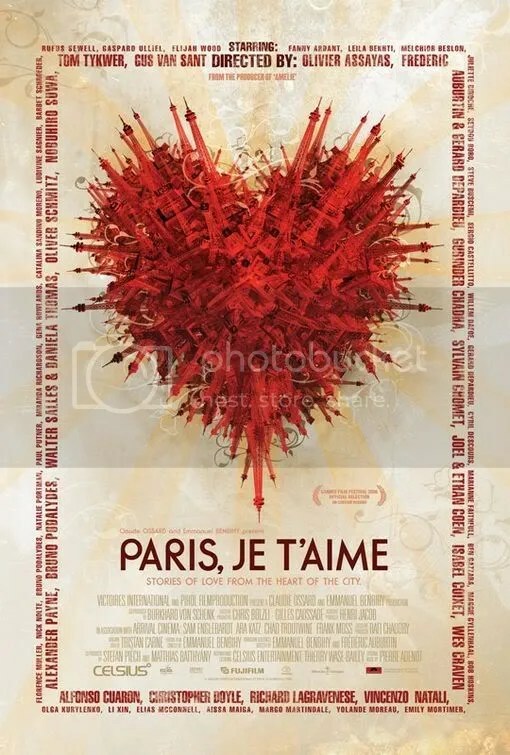 “Paris Je T’aime” is a new film from the same producer of “Amelie”, that other love note to Paris. But here the Directors are far more diverse. Everyone from The Coen Brothers to Walter Salles to the cinematographer Christopher Doyle to Alphonso Cuaron to Gerard Depardieu to Alexander Payne to Tom Tykwer to Wes Craven to Gus Van Sant ( and many French directors as well who I will now take the time to get to know)… well it seemed like every director or person who wanted to direct something in Paris poured their heart into one of the 18 shorts that comprised this film – you can see all of their names circling the poster along with all of the actors too. And thank God they wanted to. What could have been an exercise in excess never once lurches as it passes from one skillful hand to the next. It sings, vaults and dances circles around your senses. One moment laughing at the absurdity – the next moved by something suddenly emotional. This film captures Paris in snapshots, beautiful little snapshots. Precise, keen snapshots. The subtlety at which some of the stories were told baffled and surprised me. All of you wannabe filmmakers out there who feel like a short film has to be a half hour long, watch this movie and learn. And as I stated Paris isn’t the only thing the makers of this film are in love with, they show a passion for all kinds of cinema. And it’s a joy to watch them share their visions. Check it out. It’s a gem. Watch these trailers. Do not search for the American trailer, they give away too many plot points…idiot American Producers. Congratulations to the “Simpsons”. 400 episodes, and I look forward to the movie. It was fun to see the original sketch open the 400th earlier this evening. It’s too bad though they wasted a lot of the funny on the police dog/snake episode a week ago (one of my favorites I think). But they still weren’t bad, solid episodes in fact. Seeing the Simpsons having come so far though makes me sad about Groening’s other cartoon venture, “Futurama”. A show I didn’t get into when it first happened upon the scene, but the more I see on Adult Swim, the more I love. It’s sad to see some of the best shows disappear. “Arrested Development” was another. As was the cop drama “Boomtown”. But I’m going to stick to the point. The more I see “Futurama” the more I love it. An episode hit me so hard in fact recently that I literally went from weeping in fits of laughter to weeping out of sheer sadness. Something about the episode in which we see how the hero, Fry, has been sent to the future and his dog that tries to find him, hit me somewhere deep down. I saw it coming too. I felt it sneaking up on me. I knew it was going to happen and when it did, I couldn’t stop myself from crying. I couldn’t help it! It was beautiful and sad. It just shows the true brilliance of what this show was and what it could have continued being. It’s probably become one of my favorite television episodes of all time. For those of you who have seen this episode and you don’t know what I’m talking about, I pity you. For those who haven’t seen this episode, it’s a good one to start with…actually a great one to start with. Even if you don’t wish to watch the rest of the series, which I’m going to start doing. But don’t…DO NOT look up the scene on youtube. You have to see the whole friggin’ episode! Not much makes me cry like that. I’ve been told Kurosawa’s “Ikiru” can make a grown man cry. I unfortunately put the second side of the movie in first (a two-sided Japanese DVD! You might have done it too!) and watched the second half first. I was so confused I wrote to Roger Ebert and thoroughly confused him as well, but one of these days I’ll go back and watch the whole thing and I hope it affects me in a similarly profound way. The other film of the last few years that made me weep was the first half of the HBO mini-series “Angels in America”. It overwhelmed me so that I crawled into the bathroom and curled up in a fetal position and wept for awhile. Not much gets me that deeply. Now I can add “Futurama” to the list. It’s nice to find those. Anyone willing to admit to their’s? I always find it funny to watch a foreign film and to see the absolutely horrible actors they get to play American and British people. The two Japanese war films I spoke about in my other look at foreign war films below also had preposterously bad Caucasian actors. In “The Burmese Harp” the British soldiers are a couple of the worst actors I’ve laid eyes upon. The one in charge blinks so much you want to give him an eye drop. And what was even more upsetting was that when we finally come upon the American soldiers in “Letters from Iwo Jima”…you know the ones that kill the Japanese hostages…they were horrible too! This is an American production and they still couldn’t find solid English speaking actors. I mean it’s one thing when it’s a martial arts extravaganza, but Clint Eastwood? Anyone else think of a foreign film in which we the people of America were portrayed by talentless hacks? I always love it when a groundbreaking film appears in our cinemas and the press jumps on top of it spewing forth grandiose phrases about how important it is to our changing cinema, when they forget to mention that another country has been doing it for years, sometimes decades. It always bothered me that “The Matrix” got this sort of press. Somehow several decades of martial arts cinema was suddenly over looked and then everything that was released in China over the next 5 years was compared to “The Matrix”. Baffling, I say! And frustrating to one who loves Hong Kong cinema. It was nice to hear so much praise being handed to “Infernal Affairs” when Scorcese’s film won so many Oscars this last year and when Sophia Coppola praised Wong Kar Wai when she won best screenwriter for “Lost in Translation”. Credit where credit is due I say. Which is why it always bothered me when critics and journalists praised Clint Eastwood’s”Letters from Iwo Jima” saying it might finally open up Japanese cinema to look at the war from a different point of view. And some Japanese journalists were saying this. Others have claimed that Eastwood’s vision is what Americans would like to believe the Japanese were like. I personally had mixed feelings about the film myself. I wondered specifically how accurate the Japanese men were when they acted more like American men. But like most films, we’re critiquing the American film as if no films had come before it, which I wondered if that was the case or not. Recently a film was recommended to by the lovely people at Netflix. A film directed by Kon Ichikawa called “The Burmese Harp” which was originally released in 1956. It is an anti-war film depicting Japanese soldiers in very much the same way that “Letters” depicted it’s soldiers. “Harp” is about a young group of soldiers just after the end of the War who are brought to a camp in Burma, India. One of these soldiers, a young officer who plays the harp, is ordered by his Captain to go and convince a group of Japanese soldiers that they should surrender to the British. The British officers give him a half an hour to convince the Japanese soldiers burrowed in the side of a mountain (imagery very similar to “Letters”). The young harp player encounters a group of soldiers unwilling to surrender, how would that, after all, help their country? These are the same conflicts brought to light in “Letters” and this is from a Japanese perspective. They didn’t need an American filmmaker to bring these issues to light. It was done almost fifty years ago! But we take credit regardless. The rest of the film follows the divergent stories of the men in the camp and the harp player and the very difficult decision he has to make. Needless to say it is an incredibly beautiful story. Worth watching. I’ve seen several great anti-war films over the past year, many foreign. “Forbidden Games” Dir, Rene Clement. Brilliant. War and how it affects children. “Japan’s Longest Day” isn’t so much an anti-war film (though close) but it does give an intriguing look at the few days leading up to Japan’s surrender and some of the craziness that ensued. It’s interesting because the director doesn’t take a strong stance one way or the other. “The Human Condition” A breathtaking, raw and potent trilogy that at it’s 9 hours length leaves you feeling like you’ve just gone through a war youself. One of my personal favorites is the British version of “Lord of the Flies” which is available on a nice Criterion DVD. It feels like there’s been more, but the director of “The Burmese Harp” has several more as does Akira Kurosawa (one of my favs) that I intend on viewing soon enough.